Item2004-10-0050 - Hyatt Moore with the Rendille Warriors painting. Item 2004-10-0050 - Hyatt Moore with the Rendille Warriors painting. Hyatt Moore with the Rendille Warriors painting. 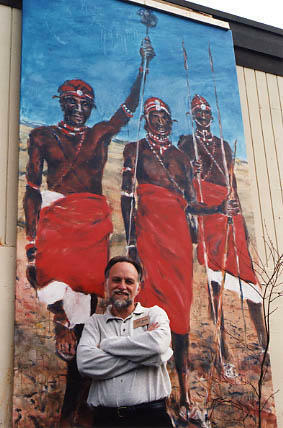 Photograph of artist Hyatt Moore posing in front of one of his oil on canvas paintings, "Three Rendille," which was donated to the Norma Marion Alloway Library.